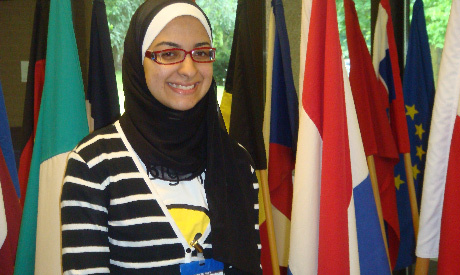 Unlike the majority of Egyptian scientists who travel abroad to make their mark, Azza Faiad, a 16-year-old from Alexandria, made the discovery that made her famous whilst still at school in Egypt. She won a special prize at the European Young Scientists Competition held in Finland in September 2011 for her discovery of a new way to break down plastic waste into biofuel using a new, cheaper technique. Faiad discovered her passion for science when she was seven and when she was eight she joined a science club at the Bibliotheca Alexandrina. "Bibliotheca Alexandrina helps link young people with suitable mentors, and this is where I met my mentor Nourwanda, to whom I owe my success," Azza said. Nourwanda Sorour is a distinguished student in petrochemical engineering at Alexandria University and taught Azza chemistry. They worked together on her prize-winning project until the final stage. Azza was rewarded with a trip to the Culham Science Centre in the UK where twenty eight countries are undertaking a huge experiment for nuclear energy supported by the European Fusion Development Agreement (EFDA). "Involving many different people from different countries with different skills and training gives a perspective on science that is very rarely seen from the classroom," Dr Phil Dooley of the EFDA told Ahram Online. Azza wishes the Egyptian science curriculum focused more on creativity than memorisation. "I'm not the first in my class as many expect me to be! I'm rather a very good student who dreams of doing something remarkable for my country," Azza asserted. Azza hopes to study chemical engineering at university and implement her biofuel project. "Young people are the future and we want to bring them into science," Duarte Borba, senior advisor to EFDA told Ahram Online. Azza also participated in the Euro Science Open Forum 2012 (ESOF2012) that was held in Dublin this month. She won second prize in the 'Invention Convention' contest in which the scientist or entrepreneur explains their idea in only three minutes to a panel of experts from both academia and industry. "It was very challenging to compete with students and scientists from different countries, and to explain my project in three minutes," Azza said. The Research Development and Innovation Programme (RDI) sponsored Azza to attend the forum as part of its efforts to promote science communication and encourage talented Egyptians. "No doubt getting another award in Dublin indicates that Azza is really gifted and she will have a promising future in science," Nourwanda concluded. "Going through her studies, Azza should learn about herself, her strengths and weaknesses, and how she can work with other people who are different and complementary to herself," Dooley explained. Dooley added that we should always try new things in which we will find out more about ourselves, and will help us make the right choices and use our skills in the best way. Beyond the technical part of her story, Azza is an example that gives young people a clear message that they can achieve their goals without having a VIP network or extraordinary circumstances. At this critical time in Egypt's history, we need inspiring models, motivated individuals, and competent institutes in order to rebuild our country. Congrats to Sister Azza and may Allah always be with her. Islam needs people like her to win the hearts of the world, to prove that Muslims still contribute to the world as they did in ages past. Let's pray our youth will be inspired by this young lady to invent things that benefit humanity and not just focus on making money. How heartening it is to see young Muslims like her meaningfully contributing to society. I really congratulate Ms.Azza, she represnts her generation that they have the capabilities to implement their knowledge into facts. I urge the egyptian officials to adpt and promote this gem to be a talented future scientist.